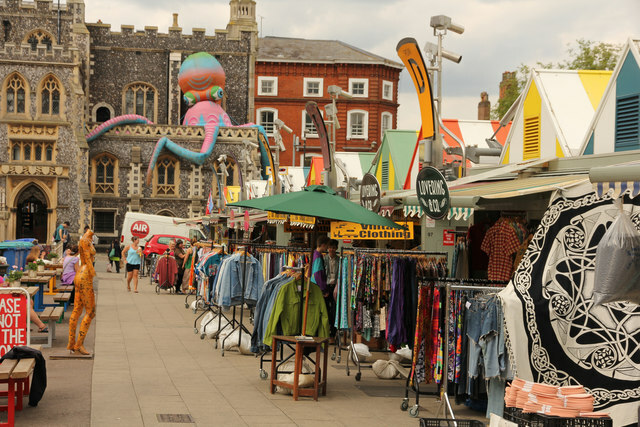 Norwich Market has come through a challenging phase in its long history over the last 10 years. Originally a medieval Market it was established on the current site in Norman times. It was re-formed in the 1930’s when the current City Hall was built and then refreshed again in 2005. As buying habits changed and the ranges available at supermarkets grew it fell into decline, but more recently it has seen a resurgence. Changes in approach, some fresh ideas from City Hall and of course the hard work of the stallholders has seen it return to a vibrant, busy and thriving part of the Norwich retail experience. It includes a mix of established and new stalls and has businesses selling a range of produce including; Fruit & Veg, Fresh Flowers, Fresh fish, clothes and a wide cross section of food outlets. I first met up with the new Council Market Manager Kristina Fox last summer just after we both started new roles and have been impressed with her vision, drive and energy to make the Market a bigger and better environment for stallholders and customers alike. We are now working together on new initiatives to help new and existing businesses thrive in this dynamic environment. Occupancy of the market has gone from 71 -92% in just 12 months and now further investment and new ideas are being considered. The pop up stall is just one example where prospective new businesses can “pitch” their idea to customers for as little as £15 per day without any long term commitment. My Advice to entrepreneurs thinking of starting a business in Norwich is to give the Market a look and you might be surprised just how much it’s changed. Ian Bird is now available to talk to existing and prospective stallholders on Norwich market once a fortnight, ring 08456 099991 for more information.